Resistance thermometers, also called resistance temperature detectors or resistive thermal devices (RTDs), are temperature sensors that exploit the predictable change in electrical resistance of some materials with changing temperature. 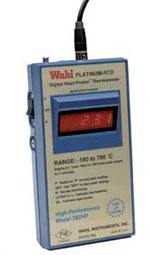 As they are almost invariably made of platinum, they are often called platinum resistance thermometers (PRTs). They are slowly replacing the use of thermocouples in many industrial applications below 600 °C, due to higher accuracy and repeatability. Once submitted, we will try and place you in contact with a suitable Resistance Thermometers supplier within 48 hours. Resistance Temperature Detectors (RTDs) from Weed Instrument Co., Inc.
Resistance Temperature Detectors (RTD’s) from Convectronics, Inc.
Resistance Temperature Detectors from Pyromation Inc.